Developed in Affle Labs, Ripple has been designed as an integrated ad network for all smart screens including computer, mobile, tablet and smart television. Digital media company Affle has announced the launch of Ripple, its rich media and video advertising network. Developed in Affle Labs, Ripple has been designed as an integrated ad network for all smart screens including computer, mobile, tablet and smart television. Ripple functions in a simple way. Through its ad engagement unit ‘Storm’, it utilises technologies like image search, voice recognition and face detection to identify the most relevant context in the content, in this case a video, to deliver relevant advertising links online. The new platform seems to have drawn attention already, with the company claiming to be working for partners such as Samsung, P&G, STAR, Business Standard, Dainik Bhaskar, Beoscope, Bolanews and Sambawa. “We strongly believe that effective advertising is one which is engaging and relevant for consumers. 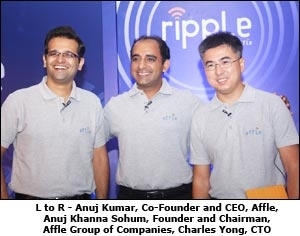 Over the last one year, we have been doing a lot of product level research and development and user research to create the Ripple platform such that advertising delivered through it will reach the most relevant consumer, on the most premium content and at the most relevant context across all smart screens,” says Anuj Kumar, co-founder and CEO, Affle. For the record, headquartered in Singapore, the Affle Group’s businesses include Affle Rich Media Business, Affle Media Lab and ad2c (a joint venture between Affle and D2C).